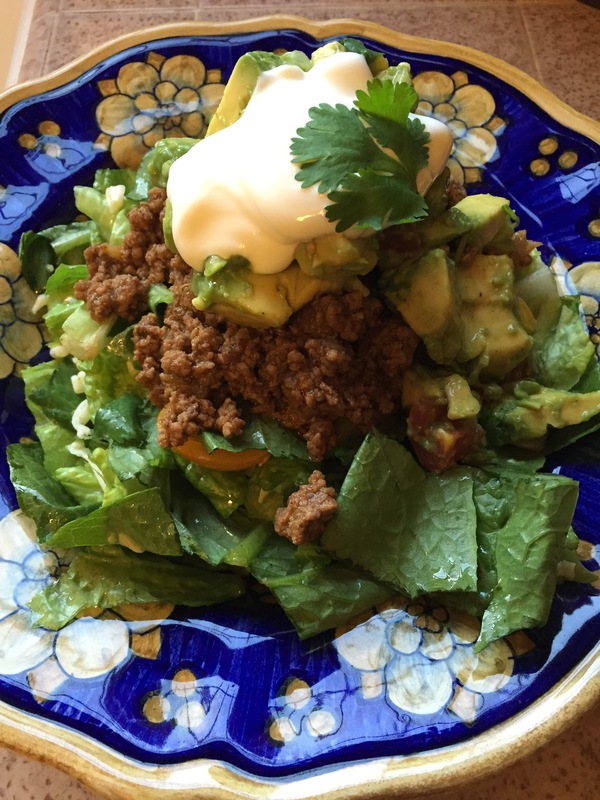 Whenever I make this taco salad it brings me right back to those family dinners way back when. Nice memories, great food and lots of laughter. 2 tablespoons olive oil and sauté 1 chopped onion. 2 lbs ground beef and cook until brown. Drain and return to stove. Add 2 tablespoons Taco Seasoning(recipe follows) and 1/4 cup water and stir. Toss salad with 2 tablespoons olive oil. Plate your salad in large individual bowls. Top with warm ground beef mixture. Add a dollop of guacamole and a dollop of sour cream. To make this recipe extra special I like to add about ½ cup my New Mexico Green Chile Sauce to the ground beef mixture. Its an extra 30 minutes of prep but well worth it. I usually make it ahead of time and keep it in the refrigerator. Add green chiles and saute for a minute or two to blend the flavors. Sprinkle with cornstarch (optional) and stir. Add broth slowly and stir. Add pinto beans and a handful of baby tomatoes. Lower the flame, and cook 30-45 minutes. Can last in frig for up to 1 week. This entry was posted on Monday, July 20th, 2015 at 1:58 am	and posted in Category. You can follow any responses to this entry through the RSS 2.0 feed.